We welcome all zoners to the Undernet, and to the #outlaws_players channel. If you are new to using MIRC, here are some pointers. How do I get to MIRC? Download the program MIRC here, or get it off www.MIRC.com. It is free. Once downloaded and installed, you need to join an undernet provider. If you are North American, use a North American server, if European, use a European server, though any undernet server will do. How do I get to #outlaws_players? Once on an undernet server, choose to join the channel #outlaws_players, or type /join #outlaws_players in your status box. Voila, you're here. To auto join in the future, go to file/options/connect/perform and check "enable peform on connect", make sure it says "All Networks" and type in "/join #outlaws_players" in your perform commands, then hit ok. Don't use the "". You will auto connect to our channel next time you open MIRC. How do I get a map, send or receive a file? Dontknow has an auto server. If you host a game, send him the map so others can get it off his server. He has thousands of maps already, but if it is new, send it to him first. click on his nick, backclick to dcc/send, then scroll to the file where you keep your zip of the map you intend to play, then send it to him. The map name is "filename.zip", whatever it is. If you want Dontknow to send you the map automatically, type !send filename.zip and he will send. For example, if you want the map fred farm, type !send fredfarm.zip. You MUST use the same spelling and spacing as the zip file name to access it. Also, the host can send the map to anyone directly by clicking on their nick, then backclicking dcc/send and browsing to the file. All files are sent to one another this way. Another way to send is to go up top to dcc, then to send, then type in the name of the person you wish to send a file to, then browse to find it and hit send. I tried to send a file and it wouldn't send. Why? There may be several reasons. You may need to disable your firewall, if it is too disruptive. It also may be that you need to unblock sends in your MIRC. To do this, go to file/options/dcc/options and uncheck "ignore" everywhere. File/options/dcc/folders you can select "ignore only" and list the kind of files you want to ignore allowing others to accept. Personally, I ignore all midis since they are quite irritating, and ignore most exe's, unless it is sent by someone I know. Ok, I got the map. Where is it, and what do I do now? The map sent from Dontknow (and any file sent to you) will automatically go to your c:/mirc/download folder. Extract the map from your c:/mirc/download folder to your c:/program files/lucas arts/outlaws directory to use it. Where can I find out about the games in play? The games are posted in the topic of the channel. If you place your mouse over the blue topic, a drop down screen will show you the full topic, with the name of the game and the IP to join. It should also state whether the game is direct play or not. Unlabeled games are usually winsocket games. How do I join a game in the topic? You have two options. You can boot up outlaws, as if playing single player, but choose the multiplayer option. Then choose either winsocket and TCP/IP (most use that) or if you are on a lan or hub or router, choose direct play/TCP/IP. Then type in the IP of the game you wish to join. It should be in the topic. Then join. The other option is to use the program Outnet, which auto locates the games, and you just click on join. How do I get outnet? You can ask for it in the channel, or you can download Outnet here. Once downloaded, look in your c:/mirc/download folder, or whatever folder you downloaded it to. Extract it to your c:/mirc folder. Then, type "load -rs outnet.mrc" in the main channel of #outlaws_players to load it. A screen to configure it should pop up. Tell it where to find your outlaws folder, usually it is c:/program files/lucasarts/outlaws. Tell it your nick for games and hit ok. In the future, just click in the center of the channel, and choose outnet. Then it will auto detect the games listed in the topic, then join one. It's that simple. How do I host a game? You need to boot up ols in multiplayer, choose either winsocket if you can, or direct play if you can't play winsockets, and the TCP/IP option. Then host whatever map you want. To post a game in the topic for everyone to see, simply double click in the center of the channel, and the topic screen will appear. Add your game to the front, but don't remove others' games. Then hit ok and it will appear both in the main, and on the topic. We will try to have a winsocket and a direct play game hosted all the time, but anyone is welcome to host and post a game. Please use the format "DM type !send mud.zip @ 24.56.83.215" or "CTF direct play type !send desptown.zip @ 24.80.93.214" or "1x1 @ Repair @ 24.53.64.219". You get the idea. We need to know what kind of game, what map we need to download, if any, what Ip, and whether it is the standard winsocket, or a direct play game. Then start begging players in the main to join like I do, hehe. Anyone can host, but cable hosts are preferable. Please remove your game from the topic if you take the game down, but leave the other games up in the topic. Who are the @ and + people? The @ people are the ops, the channel managers. They can boot you or ban you if you cuss alot, so please don't. Mostly, they are helpful answering questions and hosting games. The + people are honored and frequent guests who know alot about the channel, and can also help you if you are confused. The + allows them to speak when the channel is moderated and only @ and + can speak. This rarely happens unless there is a tournament and rules are being given out or something. When are the tournaments? We used to have tournaments every Sunday, but then hackers came out, and they became less attended, so I quit hosting them. If the hackers will give us a break and if lots of people REALLY want them, we might bring them back, weekly, but that is to be determined by interest and channel support. At this point, I'm just glad to have a place to play outlaws. How do I private chat with someone? Simply click on their nick, then backclick on query, and a private chat box will open to you. Or type "/msg nickname hi" using the nick of the person you want to talk to, and saying whatever you want. When they answer, a box will open. Either way is fine. When you see a red name at the bottom of your screen, it is a private chat initiated by someone who wants to talk to you. If you x it out, it will close it. You can also make a channel for several people to join if you want to talk to a small group. Can I make a channel? Sure, type "/join #yournick" or any name you want to call your channel. It will be created on the spot, and any friends you want to join it with you can. Then you are the @ OP and can make any rules you want. Once all quit who are in the channel, it disappears, unless you get it registered. How do I register my nick or channel? 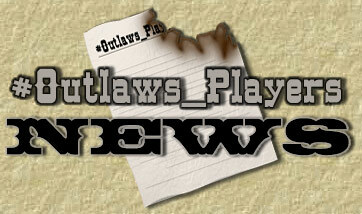 We are in the process of re-registering #outlaws_players. First you need to have a registered nick. To do so, go to http://cservice.undernet.org/live/ and register your nick. You will need an email connected to an address, not something like hotmail. They will email you a login. You'll need to change it to something you can remember easily. To do so, first log in, then change it to an easy to remember login. Next, you need to authenticate. Type "/msg X@channels.undernet.org login <username> <password>", without the "" in the main channel. You can add this command to your perform list, so that you authenticate automatically every time you join MIRC. Go to file/options/connect/perform and type in "/msg X@channels.undernet.org login <username> <password>", without the "", then hit ok. Now every time you join, your nick is registered. Once you have 10 registered users, you can register your channel, and it will be an official channel. What else can you do on MIRC? We are not the only channel on MIRC. There are THOUSANDS from all over the world. Go to www.mirc.com to read about all the options available to you. In our channel, besides gaming, you can set up a server for people to autoget files, you can play songs or wavs, you can display colors or pictures, there are so many ways to enjoy communicating. What fserves are available in #outlaws_players? Dontknow, Goliath` and I (Garbotalk) have fserves currently. This allows you to get files from us at your request, and we don't even have to be at our computer to send it. Dontknow has two configured. If you type !send filename.zip, he will send you a map. If you type !level, you can see all the maps he has in his fserve to choose one. Goliath` and I have ones you can access by typing "!Garbo" or "!Goli". A dcc chat will then show up at the bottom of your screen. To navigate it, type "dir" for directory, and you will see the folders you can review. Then type "cd foldername" and the folder name you chose will open. Then again type "dir" to see what is in that folder. Once you see something you want to download, type "get filename.zip" and it will auto send to you. Obviously, you must use the correct file name you want to acquire. To go back to a previous folder, type "cd..". That is how you operate fserves, in our channel, or any channel.